The history of the U.S. Embassy in Japan dates back to 1853, when Commodore Perry’s ships arrived in Japan. In 1854, the Treaty of Peace and Amity between the U.S. and Japan was signed, and in 1856, Townsend Harris, the first American Consul General, opened a temporary consulate in Gyokusenji Temple in Shimoda. 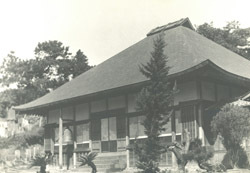 Since then, the U.S. diplomatic mission (first as a legation, later as an embassy) in Japan has been located in Zempukuji Temple in Azabu, Tokyo; the foreign settlement in Kannai, Yokohama; and the foreign settlement in Tsukiji, Tokyo. The mission was finally relocated to its current location in Akasaka, Tokyo, in 1890. 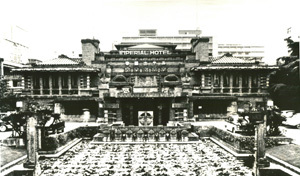 After the Embassy building was damaged by the Great Kanto Earthquake in 1923, the Embassy opened a temporary office in the old Imperial Hotel. 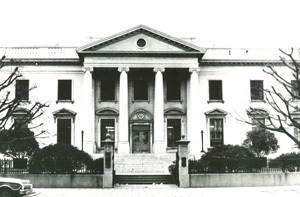 In 1931, the Embassy was rebuilt. 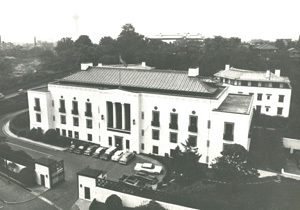 The white Embassy building was used for more than 40 years, but as times changed the operation outgrew the building, and in 1976 the Embassy was rebuilt as a modern building designed by César Pelli and Norma Merrick Sklarek. This building still stands today. The timeline below is a summary of the locations of the U.S. legations and embassies, and the history of their buildings. July 1853 Commodore Matthew Calbraith Perry and his “black ships” arrive off Uraga (Edo Bay), carrying a personal letter from President Fillmore to the Emperor of Japan. March 31, 1854 The Japanese shogunate government and Perry sign the Treaty of Peace and Amity between the U.S. and Japan (Treaty of Kanagawa). Japan ends its period of isolation, opening two ports, Shimoda and Hakodate, and accepts the posting of a U.S. Consul in Shimoda. 1868　 The Meiji Era begins. Edo becomes Tokyo after the Meiji Restoration. 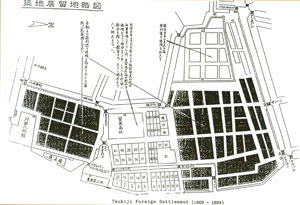 1869 A foreign settlement is opened in Tsukiji, Tokyo. 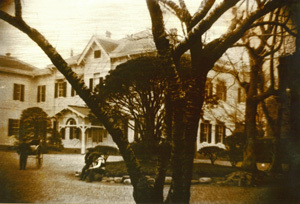 1874 Minister John A. Bingham moves the legation and his residence from the foreign settlement in Yokohama to the foreign settlement in Tsukiji (currently Akashi-cho, Chuo-ku, Tokyo). Later, St. Luke’s International Hospital was built at the site of the Tsukiji foreign settlement. Three sets of commemorative stone tablets were placed on the hospital premises to show that the American Legation once stood there. One of the sets was given to the U.S. Embassy in a ceremony in 1984, during the term of U.S. Ambassador Michael J. Mansfield. 1889　 Tokyo becomes the City of Tokyo. 1890 The Japanese government and Minister John F. Swift enter into an agreement to lease the buildings and land at the Embassy’s current location (Old address: 1 Tameike Enokizaka-cho, Akasaka-ku, Tokyo). The American Legation was relocated from Tsukiji to Akasaka. 1906 The American Legation is upgraded to Embassy during the term of U.S. Ambassador Luke E. Wright. 1923 The old wooden buildings used as the American Legation/Embassy from 1890 are destroyed by the Great Kanto Earthquake and the subsequent fire on September 1, 1923. The Embassy opens a temporary office at the old Imperial Hotel. The hotel, located in Uchisaiwai-cho, Kojimachi-ku, Tokyo (currently Chiyoda-ku, Tokyo), was designed by Frank Lloyd Wright. 1931 During the term of U.S. Ambassador W. Cameron Forbes, a three-story white Embassy building, Ambassador’s residence, and two adjacent apartments are built at the Embassy’s current location (1-chome, Akasaka, Minato-ku, Tokyo). The buildings were designed in New York by Harold Van Buren Magonigle, with the assistance of Antonin Raymond in Tokyo. The contractor was Wharton Green and Company of New York, and the construction in Tokyo was handled by Obayashi Corporation. Captain T.D. Stamps of the Engineer Corps of the U.S. Army acted as the contracting officer’s representative and was chief inspector. Ground was broken in November 1929. A cornerstone ceremony was held on May 26, 1930, and former U.S. Ambassador to Japan, William R. Castle, Jr. (1929-1930), laid the cornerstone. 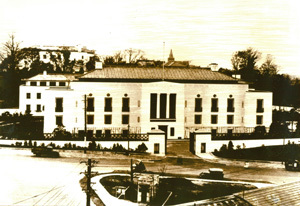 The building, completed in 1931, was called “the (Akasaka) White House,” because of its white exterior walls. December 8, 1941 The Pacific War begins with the Japanese attack on Pearl Harbor in Hawaii. From this date, the U.S. Embassy remains closed until 1952. August 15, 1945　 Japan surrenders. Immediately after the war, the Allied Forces, consisting of the U.S., England, France, Soviet Union, and others, occupy Japan. 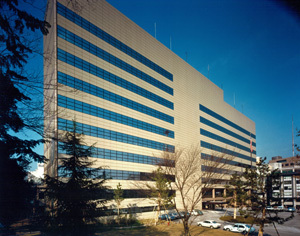 The General Headquarters of the Allied Forces (GHQ) is established in the Dai-Ichi Mutual Life Insurance Building in Tokyo. General Douglas MacArthur of the GHQ resides in the U.S. Ambassador’s official residence. September 8, 1951　 The war officially ends and Japanese sovereignty is restored with the Treaty of Peace with Japan (San Francisco Peace Treaty). 1952 The U.S. Embassy reopens. In addition to the main Embassy building (at the current location), a nearby building (2 Akasaka Aoi-cho, Minato-ku) is purchased from South Manchurian Railways Company, Ltd., and is used as the Embassy annex.he main building contains the Ambassador’s office, Political Section, and military offices, while the annex houses the Consular Section, Public Affairs Section, Procurement and Coordination Commission, and other offices. The annex is sold to Mitsui Real Estate Development Company in 1973 and handed over in 1977. 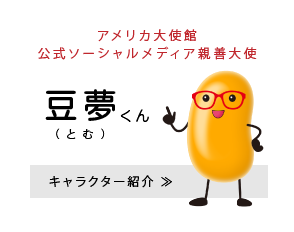 1973 The Consulate in Yokohama is merged with the U.S. Embassy Consular Section in Tokyo in 1973. 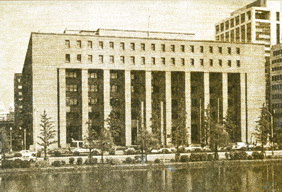 The building of the Consulate in Yokohama, designed by J.H. Morgan, was constructed at 6 Yamashita-cho, Naka-ku, Yokohama in 1932. 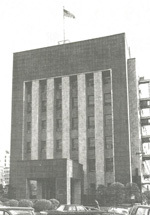 1974 The main Embassy building and the two employees housing units, which had become unsuitable for the various embassy services and internal communications, are demolished in May 1974. A ground-purifying ceremony for the new Embassy building is held on July 30, 1974. 1976 The new Embassy building (the current building) is completed in August, 1976, and it is opened on September 6. The building was designed by César Pelli and Norma Merrick Sklarek of Gruen Associates of Los Angeles and constructed by Obayashi Corporation. The construction required 400 kilometers of electrical and telephone wiring, 13 kilometers of walls and partitions, 40,000 square meters of carpets, and 20,000 tons of concrete. All of the materials, except for the concrete, came from the United States. The Embassy staff moved into the completed building on Labor Day. A time capsule commemorating the new building was buried during a ceremony on the evening of September 22. The time capsule, a copper box, had been originally been buried in the ground when the old Embassy building was completed in 1931. The contents included Japanese coins, a list of foreign diplomats, and newspapers from that time. In addition to these items, U.S. bicentennial commemorative coins, Japanese coins, the day’s newspapers, and other objects were added to the box to commemorate the completion of the new building. The time capsule was buried under the cornerstone at the base of the American flag at the main entrance to the Embassy. The formal dedication ceremony was held on September 24, 1976. The ceremony was attended by James D. Hodgson, U.S. Ambassador to Japan; U. Alexis Johnson, former U.S. Ambassador to Japan (1966-1969); Embassy staff; and a number of guests from the Japanese government, news media, and academia.